First and foremost, I want to offer you, the reader, a disclaimer. I am possibly one of the worst people around to give any sort of advice or comment on fashion or style. But I have given myself a creative license just this once, on the back of the argument that if ex-cricketer and former Scale-4 bank officer Chetan Chauhan can become the boss of the National Institute of Fashion Technology (NIFT), I can take the prerogative of taking the necktie (or just tie) to task. First and foremost, I want to offer you, the reader, a disclaimer. I am possibly one of the worst people around to give any sort of advice or comment on fashion, style or any other such even remotely related topic. But I have given myself a creative license just this once, on the back of the argument that if ex-cricketer and former Scale-4 bank officer Chetan Chauhan can become the boss of the National Institute of Fashion Technology (NIFT), I can take the prerogative of taking the necktie (or just tie) to task. To begin with, statecraft, politics, military and government have historically been directly or indirectly involved in the popularization of consumerism. Companies promoting products on the back of capitalistic consumerism look to piggyback ride on governments, the policymakers. It's an age-old "you scratch my back and ill scratch yours" formula which has succeeded for open market states, and creates much of what you and I wear, use, watch or eat. One of statecraft's oldest -- centuries old -- fashion statements is also the one that has perplexed me the most, the necktie. A piece of cloth tied around the neck has been a functional form of apparel for a long time, but its slide into uselessness and dysfunction also started fairly early. While early Roman orators wore "neckerchiefs" to keep their throats warm, it was first the French and later, of course, the English who created one of the most inane and silly contraptions masquerading today as an essential part of the "business" or "formal" attire wardrobe. Before I delve into blaming the French and the English, I will confess that the tie is one of my foremost grudges when it comes to attire, specifically these days when dressing "formal" could mean a million things. Coming from a very British-oriented school system in India where every other corner school in the country would like to think it's a Tudor-style boarding school from Windsor, we were given ties as part of our school uniforms from a very early age. Knowing well it is unreasonable to ask a kid to knot a tie, we used to have elastic ties, or a clip-ons if you will, an early introduction to our local 'jugaad' culture. By middle school we were expected to knot our ties properly, but some of us were way too busy attempting to (barely) pass math to bother about ties. Nonetheless, despite a school introduction to ties, not many are capable of telling a kid why he or she needs to wear one in the first place. It's not like Goldman Sachs is going to hire you from grade 8 on the basis of a Maggi noodles-stained "Monday test" sheet. The evolution of the tie into a glorified piece of apparel is apparently rooted in a mixture of war in the 1690s and sloppiness. Anyway, back to the French and the English. The evolution of the tie into a glorified piece of apparel is apparently rooted in a mixture of war in the 1690s and sloppiness. Considering not a lot of peer reviewed journals on ties and geo-politics exist (yes, I checked) some basic digging suggests that the design of the modern tie comes from 1692's Battle of Steenkerque, where a battalion of French soldiers tucked their neck scarves into their buttonholes because they were ambushed by the enemy and didn't have "time to dress properly." Now you know why the French excel at fashion on the global stage (they also seemingly got worse at warfare after winning Steenkerque, which could be attributed to ties). Thereafter, it was one Beau Brummell, an "arbiter of men's fashion" in Regency England, who seems to be the first person to have associated the necktie with "individuality and self-expression". Oddly, not too long after Brummell's nonsensical classification, in the 1800s touching a man's cravat (an old name for the tie) was also seen as an invitation to a duel -- thereby making the 1800s a missed opportunity to declare the necktie as unsafe and dangerous apparel. International diplomacy has been going for a more "casually formal" look for some time now. This included ditching the tie in the G8 conference in 2013. Nonetheless, all these years later, the tie seems to be losing its relevance to "formal" attire, even in the world of diplomacy. At a big international conference in Delhi late last year, I got up early, selected one of my many saved YouTube videos on how to knot a tie and spent a good 30 minutes in assembling a passable looking knot because the invitation asked for "formal attire". However while at this conference, much of the morning went by with me answering questions on why I was dressed so formally. This was both perplexing and infuriating to me. The opposite of the above happened to me just few weeks ago, in the southern-German Bavarian city of Munich, a plush, filthy rich place where cultural conservativeness and modernity collide on a daily basis. At a diplomatic evening organized by a foundation in the city to which I was puzzlingly invited to, I decided to ditch the tie with my formal attire, predominantly because I had no time or patience after a long work day to sit in front of a YouTube explainer video. Upon reaching the venue, a grand ballroom in one of the city's most exquisite hotels, I was very gently asked by one of the organizers to follow him for a moment. After a little walk, I was taken to a large hotel cupboard and asked to pick a tie of my choice, as the gentleman gave me a huge smile. With much disdain, I realized what was happening and tried to look for the most offbeat and loud one I could find to make my protest. But alas, this being Germany, no such thing as "offbeat and loud" existed, and I had to go for one from their collection of literally 50 shades of grey. But international diplomacy has been going for a more "casually-formal" look for some time now. This included ditching the tie in the G8 conference in 2013 where all world leaders went for a "dress down" approach. Journalist Ishaan Tharoor of The Washington Post in his piece titled "The geopolitical guide on whether to wear a tie" raised some interesting points such as how the more left leaning politicians are not wearing ties, and that in itself is a "political act". He also mentioned the ditching of Western suits and ties by leaders such as Jawaharlal Nehru, Chinese Premiere Zhou Enlai, the Iranians after the 1979 revolution or more recently Narendra Modi with his "Modi jackets" as symbolic of non-Western cultural individuality. Over the past few years, global Western leaders of the male kind (and that makes up most world leaders) also seem to have started letting go of the tie to promote what I can only believe is "politically approachable chic", or as former political director of MSNBC Tammy Haddad succinctly puts it for the American context: "It is an over expression of the way this White House has been trying to make politics more human". Not many world leaders have dumped the tie as steadily as now outgoing US President Barack Obama has. In recent times, he has been seen more often without a tie than with one, including when attending important global summits, addressing the press from the Rose Garden at the White House or hosting global leaders. He used to be a full tie guy, but perhaps taking on Wall Street, becoming a 'grease monkey' to save America's auto industry, the grinding work to get Obamacare going and so on made him realize that the tie would actually just get in the way of him pulling his shirt sleeves up. 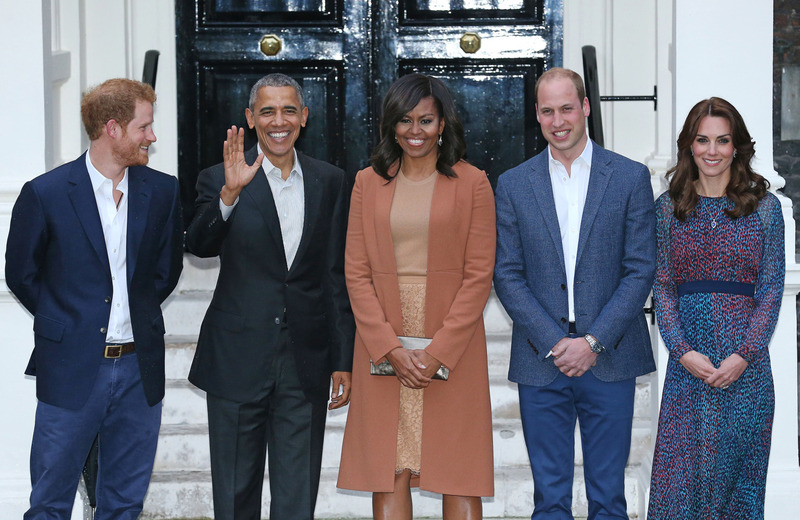 Even the British royalty, usually known for their pomp and dressing manuals, perhaps took a leaf from President Obama's casual book when both Prince William and Prince Harry posed with him and the First Lady sans ties. What does a tie even signify, other than an accidental fashion statement apparently made by a few lethargic French troops? Absolutely nothing. Obama, though, is not the only harbinger of change. The very modern Greeks did their bit too, and more conspicuously and deliberately too. After the Greek financial meltdown and formation of the new Left-leaning government, the new Prime Minister, Alexis Tsipras, eschewed the tie as part of the symbolism of change in a Greece that was moving away from crony capitalists. Tsipras's former finance minister, Yanis Varoufakis, often went even a step further, dressing in casuals when meeting his contemporaries. Perhaps it will take international diplomacy itself to collectively agree on a stance against the tie. Does it have political or ideological connotations? Does it represent "business", or "power"? What does it even signify, other than an accidental fashion statement apparently made by a few lethargic French troops in the 1690s?